This article originally appeared on the Public Art Scotland website in March 2011, the first in a new occasional series of Thoughts and Responses in which two different specialists are encouraged to explore one issue from their own perspectives. I was asked to discuss some of the big questions that face me in my professional practice. Fin Macrae – one half of artist duo DUFI – then responded as a creative practitioner who sometimes chooses to enter the public sphere. The combination of articles aims to shed light on how different professionals negotiate the possibilities offered by the public realm, as well as suggesting similarities – and differences – between our practices. When I say that I’m a town planner, what sort of image does that conjure up in your mind? Someone who decides whether house extensions are ok? A petty-minded bureaucrat who likes to exert control? Someone who negotiates with developers behind closed doors about what they might be allowed to get away with? I’m slightly ashamed to admit that my profession does all of those things. But we are also meant to be a creative force for good in society and the environment – helping to manage change in our towns and cities so that they are better places in which to live and work. At the root of this, I believe, is a pressing need for planners and planning to be more creative. Let me give you a couple of examples. Firstly, one at the city-wide or regional scale. One role that planners have is to determine how towns and cities should grow over the coming decades – how much, how fast, and where that growth that should be, so that the decisions can be made about supporting infrastructure like transport, water and schools. When places grow, the most land-hungry development is housing. So that is where most attention is focussed, and where the inevitable fights come up between residents, Councils and developers about how many houses are needed and where they should be built. But planning for urban growth should not simply be a technical exercise to calculate how many houses and how much land is needed to accommodate the government’s 20 year population predictions. It is just as important to engage in dialogue with local residents and businesses about their aspirations for what their town or city should be like in 20 years’ time. So rather than the future plan for a town or city being led by household growth statistics, it should be guided by local debate and aspirations – building positive momentum to determine the future identity of that place, rather than simply accommodating growth. This aspect of planning traditionally hasn’t had the same degree of attention as the more technical side. But creative, new approaches are afoot. Inverness and Stirling, for example, have both taken brave steps in this direction through City Visioning processes, spearheaded by their local authorities and Architecture and Design Scotland. Inverness in particular has tried to do this in a community-based way. As with any worthy pioneer it isn’t perfect, but it is a massive step in the right direction. 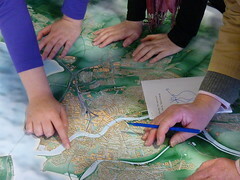 If followed through, the result should be that future change in this fast-growing city is all geared towards an agenda set by local people – focussing for example on young people, visitors and green excellence – rather than simply accommodating numerical targets for housing numbers and commercial floorspace, the conventional way of planning which has contributed to the roll-out of urban sprawl that has swollen our urban areas in recent decades. Another example, this time at the local scale, from Castlederg in Northern Ireland, a small town with a population of just 2,500 way out in the west of County Tyrone. Castlederg has the dubious accolade of being the most bombed small town in Northern Ireland during the Troubles. Locals joke that it is the only place in the word to have two Chinese takeaways, Catholic and Protestant. Just off the town square is a ruined castle. The first castle was built by the Irish before the Plantation, only to be destroyed by Scottish Protestant settlers who built their own castle. Within a few years, this was attacked by Catholic rebels and has been in ruins for the last 450 years. 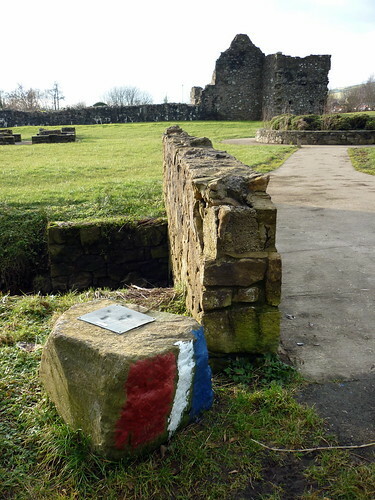 Today, the ruined castle and the attractive open space around it are regarded as a focus for antisocial behaviour by youths from one side of the community. The result of this is that what should be an asset to the town is widely seen as a liability. The potential contribution of the castle and park to the town is immense, as a park, an events space, wildlife habitat, heritage interpretation, and many other things. But as long as it remains a contested space, none of these things will succeed. The local authority wisely realised that what was needed to bring the space back into the town was a focus on people, rather than the place. 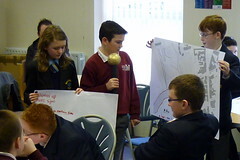 Much effort was expended on working with the schools in the town – Protestant and Catholic, primary and secondary – each of which was very keen to think about the future of the castle and open space. After working individually with each school, pupils from the different schools came together at a workshop to think jointly about how to make more of the potential of the castle. Lots of positive ideas were generated, which then formed the basis for a plan for the site, which included space for outdoor events, a community garden and a formal park area. Important though that plan was, I can’t help but think that what was more important was the contribution of that shared cross-community workshop to the bigger issue of re-building trust and understanding within the town. And you’ll understand that it’s almost anathema for a planner to say that is more important than the plan. To make these kinds of approach work, planning needs to be creative. Creative in how we engage with people and other organisations, creative in how we develop plans and policies to manage change, and creative how we seek to make better places actually happen on the ground. But there is an ever-present dilemma for the planning profession. It is governed by a professional body, it has a strong regulatory legal framework, it is a statutory duty for local authorities – but planning should also be a creative design process if it is to produce good urban environments. It is common sense that regulation and control alone will not produce attractive and sustainable places. So how do we stop all that bureaucratic “stuff” stifling the creativity that is needed to make good places? There are no easy answers to that question. But planning could seek inspiration in what I think of as “collaborative public art” – by which I mean public art that seeks to engage and challenge people in how they see places. My eyes were opened to this through the excellent work that IOTA have been doing in Inverness, particularly their temporary activities and events, which challenged my understanding of public art as static physical objects like sculpture. The regulatory world of planning has much to learn from the creative world of public art. I, for one, am looking to create opportunities to collaborate and share experiences. I hope you will do the same. That was my Thought; to read Fin Macrae’s Response, please click here.